1) Most of the committee of commissioners (CoC) meetings were held on Tuesday morning. I was on the CoC for Covenant College. There was nothing much of note in our deliberations, I did notice, however, that the Board had changed its by-laws so that they no longer assume that the board of trustees would be composed exclusively of (male) elders. They said this was just their attempt to stay in step with the General Assembly and the assumption that the Report on Woman in the Ministry of the Church would pass. It seemed a bit premature to me, however, and also seemed (and again this is merely a personal opinion) to reflect an unhealthy tendency of the Permanent Committees to be working hand in glove with the Cooperative Ministry Committee (CMC) and their agenda. An agenda which is in turn being pushed on the floor of the Assembly by the National Partnership. To this untrained eye, that agenda looks like part of a unified long-range strategic plan. Also, his election really represented one NP moderator handing over the gavel to the next NP moderator. This will probably be the trend for the foreseeable future. Given that the NP also controlled the nominating process for the permanent committees this year, their control over the apparatus of the PCA is fairly impressive. If they don’t like you, you are going to have a hard time getting elected to much at the GA level. 4) The vote was 60/40 in Jun’s favor, and I’m guessing that will be the margin for conservative losses on most of the future votes at this assembly, we’ll see if I’m right. If I am, it probably means that the age of political bloc voting at the GA is here and its likely here to stay. 5) Now for some good news: I had some really good Goat Rogan Josh for dinner and met with some dear old friends. Wednesday was frustrating in how little actually got done, a lot of which was due to the fact that the moderator clearly had little or no experience moderating a court of the church. While we may be tempted to view the moderator as an honorary position, the choice of moderator can actually make the difference between a smoothly run or frustrating assembly. Presbyters should take note of this and only choose men who can be reasonably expected to do a competent job. We started with an “assembly wide seminar” on the role of women, led by the committee that produced the report on the role of women in the church. The lack of freedom for women to exercise their gifts in the church was presented as a crisis, and while those who spoke affirmed that they did not want women to become elders or have authority, some made it clear that they wanted deaconesses as an ordained office in the PCA. Kathy Keller, Tim Keller’s wife, made that statement directly. Mrs. Keller also passionately opined that “no one in the PCA” wants women to be ordained as elders, which reminded me of her husband’s statement to the GA many years ago during the equally contentious creation debate that no one in the one PCA wanted theistic evolution to be taught in the PCA. Oddly enough, shortly after that Redeemer NYC (Tim’s church) began hosting conferences for BioLogos, the most influential theistic evolution organization in the country and Pastor Keller told Christianity Today that it was the duty of pastors to spread the BioLogos narrative. All that to say, I’m going to take assurances as to what “no one in the PCA” wants with a very large grain of salt. The seminar made it clear that they were in favor of having women become “commissioned church workers” (i.e. full time paid ministerial staff) in the PCA and it seems clear that we’ll be seeing overtures calling for ordained deaconesses as soon as next year’s assembly. While the standard arguments against slippery slopes were deployed, the idea that we’ll have generations of female deacons and ministers but NEVER elders strikes me as highly unlikely. But again, that’s just my opinion. Next up, we had the Stated Clerk’s report, who pointed out that the PCA is still growing in terms of churches and members, and thus defying current trends. The Overtures Committee then gave a partial report the highlight of which was a rule change which sought to curb the power of the CMC (Cooperative Ministry Committee) a permanent committee mostly composed of ex-moderators that had effectively reversed the normal means by which changes come to the PCA. 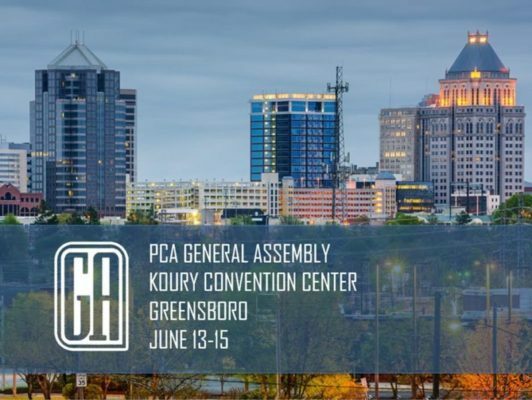 In the past, changes in the PCA happened via overtures sent by Presbyteries to the GA, but the CMC – an arm of the administration – had begun sending changes to the GA themselves. For instance, the CMC was the source of the overture that created the women in ministry study committee above. The New England overture had sought to return that power to the presbyteries. The Overtures committee was not willing to go that far, but did suggest a revised overture which would hobble the power of the CMC to effect change a bit. Amazingly, the revised overture passed. Following this we had the report of the Ad Interim Committee on the Role of women. NP leaders scurried to and fro, social media hummed, and suddenly the room was packed again. The recommendations from the committee were then discussed and voted on. The entire process was held up by endless inquiries, attempted substitutes, substitutes for the substitutes, and points of order which sucked the oxygen out of the room and left very little time for actual debate. The process dragged and wasn’t helped by the fact that the moderator, while witty, clearly has little or no experience moderating a meeting of the church and relied heavily on the stated clerk, parliamentarians, and members of the assembly to tell him what to do. It was hard to tell where we were at any given point and most presbyters were very willing to vote to call the question on the various recommendations without much real debate on the substance of the recommendations having taken place. Here’s the condensed summary that doesn’t convey any of the actual frustration. Recommendation 1, an attempt to declare that appointing the committee was an error and dismiss them with our thanks, failed. A suggested amendment proposed by Dr. Joey Pipa to simply send the report without comment to the Presbyteries for study also failed. Recommendation 3, which essentially said that sessions, presbyteries, and the GA should be using qualified women in all sorts of roles, and sending overtures that would allow women to serve on committees and agencies (previously only open to elders and in some cases deacons) also passed by an even higher margin. We were on Recommendation 4 (whose language had been improved by an amendment from David Coffin) when Mike Khandjian pointed out that worship and family time was around the corner and the we should recess. This passed overwhelmingly. I guessed that all the other recommendations would pass without too much trouble, and that turned out to be right. Conservatives just didn’t have the numbers to stop it, a situation that is exacerbated by the sad level of Ruling Elder participation (A little over 200 were present from a denomination of over 350,000 members). I didn’t have the heart to attend worship again that night, so you’ll have to look elsewhere for a sermon summary. The Assembly resumed on Thursday and immediately resumed work on the Women in the ministry of the church study report and began discussing and voting on the recommendations. The only (mildly) conservative recommendation in the report was Recommendation 4 which dealt with the practice of some progressive PCA churches who are not happy that the PCA does not yet ordain women to the office of deacon. These churches deliberately choose not to ordain any deacons because it would be unfair to ordain men without women, and instead either commission all of their deacons or don’t have deacons at all. The report had mildly rebuked the practice and recommended they stop. Accordingly an NP aligned elder stood up and recommended the recommendation be gutted and simply state: “That sessions, if possible, establish a diaconate of qualified ordained men.” A more toothless statement is difficult to conceive of and I’m glad there was no National Partnership at the Council of Nicea. One can only imagine what the Nicene Creed would have looked like if there were. I attempted to amend this statement so that it would read, “That sessions, provided their consciences allow it, consider how to include…” etc. I explained that this would provide some relief for sessions who are already convinced by scripture that women and unordained men should not be taking an active role in leading the worship of the church. Unfortunately, the majority deemed that no one should have any conscience problems when it comes to this issue, and given that any suggestion from yours truly comes to the floor with 200+ votes against it already, my amendment was soundly defeated. As a result I find myself unable to comply with the directions of the assembly regarding Recommendation 5, something I take very seriously. Then came one of the most contentious of the recommendations, namely Recommendation 7, that the PCA begin the process of creating an office that everyone agrees is not to be found anywhere in scripture, namely that of “commissioned church worker.” The moment we do so, we will no longer be able to say that our polity is derived solely from the polity found in scripture. The refusal of Presbyterians to create or submit to offices invented by the church but not found in scripture is one of our biggest differences with Episcopalians, and to reverse our stance on this issue is a much bigger deal than we are willing to admit. Despite all of that, we voted to accept the recommendation. We then had our Review of Presbytery Records, and the only really contentious issue was a minority report brought by brothers who believed that presbytery needed to be admonished over the use of a supposed image of Christ by the presbytery during worship. Such a use is a clear violation of our Confessional Standards – specifically WLC 109. The really odd thing is that even though not creating pictures of Jesus is our Confessional Position, the minority report had to argue this from the position of the weaker brethren (even though they know that in reality they are stronger) by asking the supposedly stronger brothers who don’t mind the use of pictures of Christ to provide their supposedly weaker consciences with some relief. So in essence they had to plead as though they were teetotalers asking that beer not be served at the church picnic. Several brethren argued that there was nothing wrong with pictures of Jesus and at least one made the kind of theological argument that the reformed theologians and confessions have been refuting for centuries. The minority report was eventually adopted, but only by a very close margin. What this served to highlight is that in many cases the position taken in our Standards has become the exception rather than the rule, and that the brothers who agree with the Standards are clearly considered “weaker” or possibly even cranks. This tends to confirm the adage that when error is tolerated, it tends to drive out truth. We finally arrived at Overtures, and clearly the wind had gone out of most of the presbyters. Overture #2, which would have granted Book of Church Order chapter 59 constitutional authority, was obviously going to be the most contentious issue in the report until TE David Coffin proposed that we recommit it to Overtures, thus putting off consideration until next year. I was disappointed by this decision to punt on one of the most important issues facing the church at present. In 2015 the Supreme Court of the USA created a civil right out of thin air and made something the bible calls an abomination the law of the land. It is now 2017 and the PCA has yet to address the subject in any way. Our silence at this point is becoming deafening. One might almost suspect that we’d rather not confront the civil magistrate or the culture over this issue and hope that if we don’t talk about it people will simply assume that our positions on homosexual marriage mirror those held by the PCUSA. Finally, in a rather ominous move, the assembly approved an overture that would make it harder to leave the denomination by raising the required quorum at a congregational meeting held to discuss leaving to 50% of the congregation. While this seems reasonable, gathering 50% of the total membership of any church for a congregational meeting is difficult indeed. The vast majority of our own congregational meetings have not come anywhere near that percentage. It also led some to ask why this was felt to be a necessary change to the BCO at this point. Is the PCA expecting an exodus of churches in the near future and what changes coming down the pike are they expecting might precipitate that exodus? In any event, that concludes my review of the major stuff that happened at the assembly. Here are my thoughts about the General Assembly itself. f) The “Welcoming the Refugees” theme of our next PCA Global Missions Conference. 2) Once again the NP agenda passed overwhelmingly, and they demonstrated that when the votes mattered to them they could pack the assembly with commissioners very quickly. They are also clearly moving through a well defined multi-year strategic agenda for fundamentally changing the PCA, which is a point many of my Conservative brethren fail to grasp. The Women in Ministry report, for instance, was important not because of what it said, but because it was the necessary precursor to a host of overtures moving women into voting positions on the Permanent Committees, into the diaconate, and into the role of “Commissioned Church Worker.” This combined with the push to include women in worship and all kinds of ministry cannot fail to produce the kind of long term egalitarian change that progressives dearly love. This entry was posted in Denominational Differences, Homosexual Marriage, Marriage, PCA, Politics and The Civil Magistate, Spiritual Declension, Theological Declension and tagged 2017 General Assembly, Church Offices, Conservative Review, Deaconesses, General Assembly, Greensboro, PCA, Presbyterian Church in America, Women in Ministry. Bookmark the permalink.